Hello Coffee Loving Friends and welcome to the Fall Coffee Lovers Blog Hop! I really look forward to this hop every season. The theme of this hop is of course Fall, and what says Fall more than Pumpkin Spice? 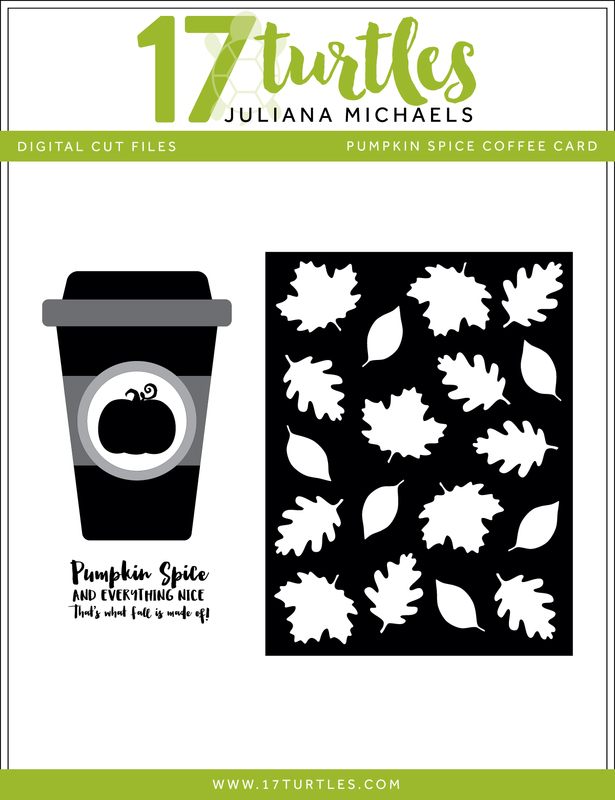 With that idea in mind, I created a Pumpkin Spice Coffee Card Digital Cut File. I then used this cut file to create a card that I want to share with you today. For more details about the hop make sure to check out the bottom of this post. As I mentioned, this card uses a new digital cut file I created, which you can download below. I began by using my Silhouette Cameo to cut out all the images from cardstock. I assembled the coffee cup and used chipboard between some of the layers to give it a little more dimension. I then cut the fall leaves background from white cardstock. This piece is sized to measure 4 x 5.25", so it's perfect for layering onto a standard size card front. Next, I had some fun with a piece of 4 x 5.25" watercolor paper. Using my Ink Blending Tools, I applied and blended the following Distress Inks: Fired Brick, Spiced Marmalade, Mustard Seed and Peeled Paint. If you don't have Distress Inks, you could also create a similar look using watercolors. To add a little interest, I splattered some water onto the paper with a paint brush and dabbed it dry with a paper towel. I then adhered this piece behind the fall leaves die cut and attached it to the card front. For the sentiment, I printed it onto a piece of cardstock, trimmed it to size and adhered it to the card front. I then attached the assembled coffee cup and my card was complete! This card came together so quickly thanks to my Silhouette and some cardstock. Imagine all the fun fall color combos you could use to create your own version of this card. Happy coffee drinking and card making indeed! 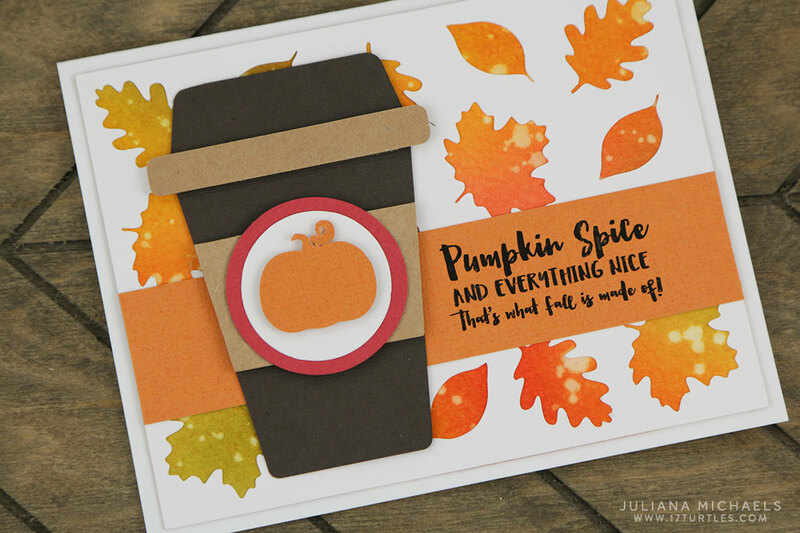 This cut file includes everything you need to create your own Pumpkin Spice Coffee Card, including the fun sentiment, and everything is sized to fit on a standard 4.25 x 5.5 card. 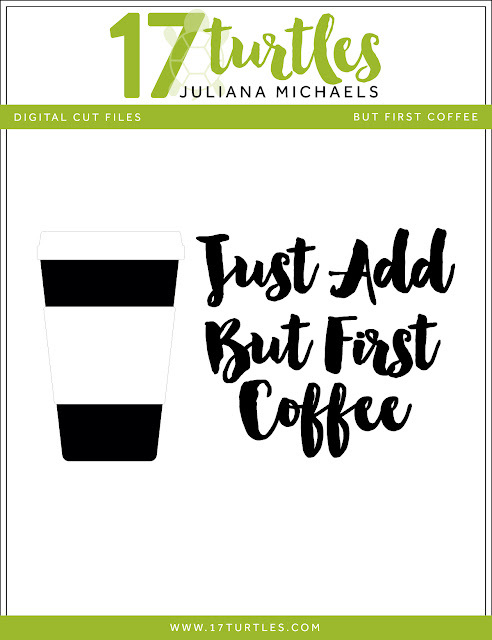 This free cut file can be used with a variety of electronic digital cutting machines, including the Silhouette Cameo and Cricut Explore. They can be used to create a full range of projects, including cards, gift wrap, tags, home decor, scrapbook pages and more. The only limit to what you can create using this cut file is your own imagination. This digital file is available in SVG, PNG, DXF and Studio formats and you may download this digital cut file for your own personal use. If you wish to use my cut files for more than your own personal projects, please contact me. If you have questions, concerns or comments about my digital cut files, please feel free to leave me a message in the comment section. The Fall Coffee Lovers Blog Hop started today, September 23, and continues through September 30. All the fun begins on the Coffee Loving Cardmakers Blog, so make sure to stop by there and share your project. By linking up a newly created fall themed coffee, cocoa or tea project you are entered to win all kinds of awesome prizes from the Super Sponsors. Also, make sure to tag your projects on social media using #fall2016clh. I hope you'll play along and thanks so much for stopping by today! 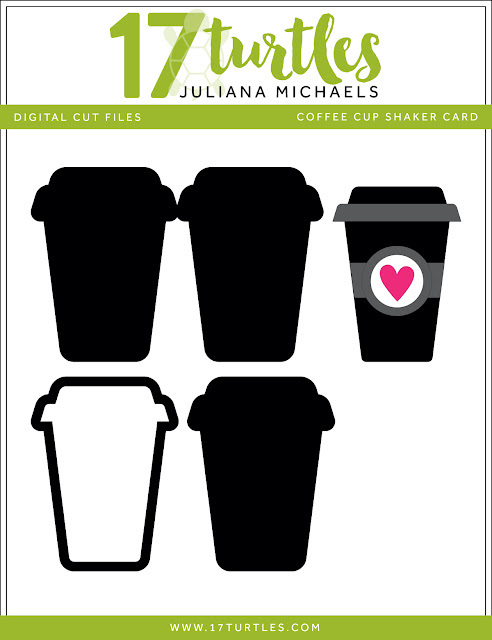 Click on the images/links to view more great Coffee themed Digital Cut Files and card ideas. What a great fall card! Love your background and the coffee cut file is awesome! Your sentiment is awesome too! Beautiful. I love the cup. Fantastic background and the cup looks ready to drink from. I love that bright and vivid fall card! The colors are perfect! Thanks for the gorgeous digi file too! Suhc a pretty card!! Gorgeous design!! Stunning card, Julianna. Love the cup and leaves a lot. THANKS A LATTE for the inspiration and free cutting files! What a fabulous card! Thank you so much. Juliana, your card is absolutely DARLING. I love your awesome cut file that you've designed. The leaves background looks awesome. Thanks so much for sharing your talents. Loving the colours and I have never tried pumpkin spice coffee. Autumn/fall isn't celebrated here in France. Perfect fall coffee card!! Love the sentiment especially!! Haven't had my first Pumpkin Spice yet!!! 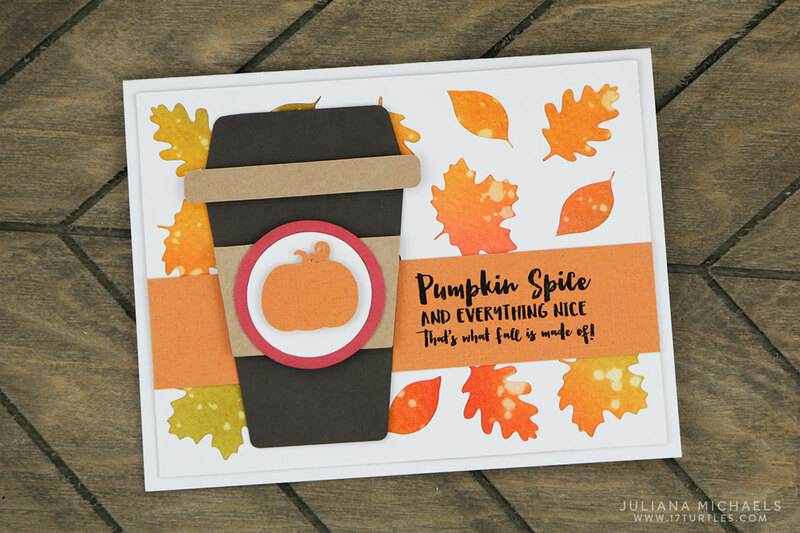 Adorable coffee card for fall, Juliana! Thanks for sharing all these cutting files too, though I have nothing to cut them with. Need to do something about that! Thanks for sharing with us at The Paper Players this week, too! Super cool, Juliana. Great colors and wonderful cut files! I just love your leaves. Beautiful card. Bold and scrumptious! Gorgeous color combo and splattered leaves, wow! Thank you for sharing the free cut file! So pretty! I love using distress inks and splattered backgrounds. Really fun card. What a gorgeous card and I love the sentiment used too! I always love the colors of Fall. Beautiful card!!! Thanks for sharing. Love the leaf cut outs! Great card! Love the watercolor leaves. Thanks so much for the cut file! Thanks for all the freebies! I love the coffee theme. Gorgeous card! Such fabulous freebies too. I think I'm the only crafter in the world that has no digital cutting machine! Oh wow! Beautiful card and colours!!! Thank you so much for the amazing free digi!!! Wow! 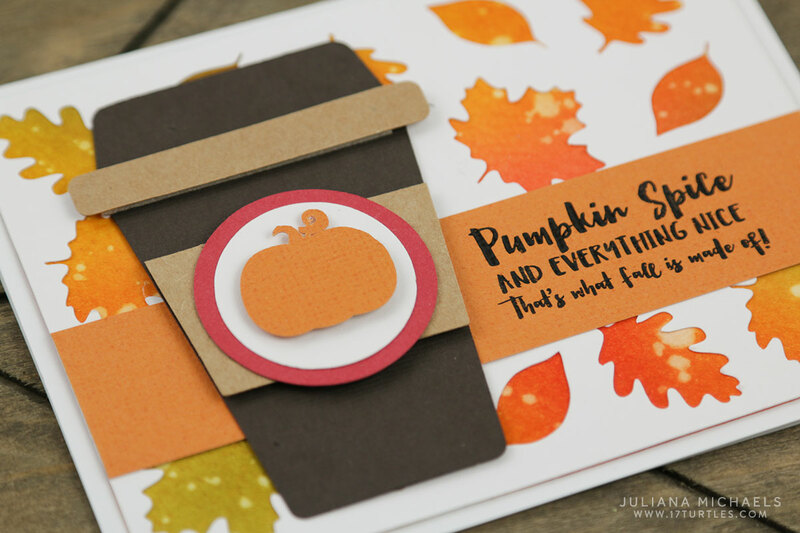 You have perfectly captured fall in your card! Beautiful colors on your leaves. This is so beautiful! And thanks so much for the cut files! I can't wait to use them to create something beautiful! I love the colors in your card, beautiful! Love your card! Thanks for the free cut file too! Such a great card in my favourite flavour of coffee. Love the cut files, whish i could use them. What a happy Fall card! Love the leaves! Great card! I love the technique you used on the leaves, the coffee cup partially 3D'd, and the great sentiment! Thanks for sharing. Love the stencil and you used it to create the background. Awesomeness. Pretty card love the leaves and the great color! Wonderful fall coffee card--thanks for the cut files.